Kathleen Paulson needs to change her life NOW, her boyfriend goes away for two weeks and comes back MARRIED!! Kathleen chucks her life in Boston and accepts a job in Mayville Heights, Minnesota, to supervise the renovation and modernization of their library. This turns out to be no small task, but the job is just the kind of distraction she needs. Not long after her arrival in town she allows to stray cats two snuggle their way into her life. She names the tabby Owen and quickly learns he is addicted to catnip. The other is a stocky tuxedo cat she names Hercules. Hercules loves Barry Manilow music as much as Kathleen, but Owen hates Barry, no matter the song and has no trouble showing his distaste. It doesn’t take Kathleen long to learn the cats are very special, maybe even magical. Life in quiet Mayville Heights takes a drastic turn when a guest of the Wild Rose Summer Music Festival is found dead. For some reason all the clues seem to point to Kathleen. It is then she finds out just how gifted her four legged feline friends are when they help her work to clear her name and quickly bring this caper to a close. The first thing that really drew me into this book was the cover, the cat’s piercing eyes. I have been trying this year to acknowledge the cover illustrators and designers, because book covers today are truly small works of art. There is no information on the artists for this cover but click on the picture, the cats eyes alone will have you wanting to read the story. The characters of Mayville Heights are so easy to enjoy from the quick wit of Roma, veterinarian by day to human doctor in a pinch, or coworker Abigail’s sarcasm, and Detective Gordon’s dry sense of humor. Add to that, loving neighbor Rebecca along with the newly transplanted Kathleen, the antics of her “magical” cats and so many more true characters in every sense of the word. There is someone for every reader to love or even hate as I do, the maddening contractor in charge of the renovation. As a former construction worker it took pure restraint not to jump right into the pages and slap him “up aside the head”! 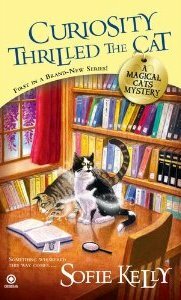 You can’t go wrong with a cozy if you have characters like these, a really good mystery, the perfect setting of a library and magical cats. A wonderful debut for what I know will be a “purrfectly” “cat-invating” series. This author has written several young adult books and has now left a paw print in the cozy mystery world with this story and I am happy to welcome her and will anxiously awaiting her next feline escapade. Be sure to visit the Author’s Website to find about her alter-ego and the other books she has written.